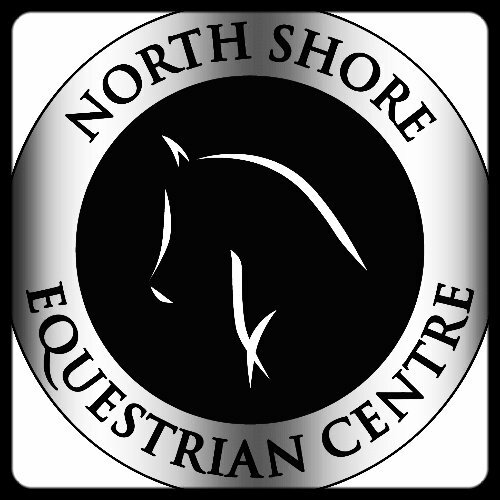 North Shore Equestrian Centre offers week-long, half-day summer camps during the months of July and August for riders 7 years old and up. Camps run from 9am to 12pm or 1pm to 4pm and aim to build a riders skills from the ground up. 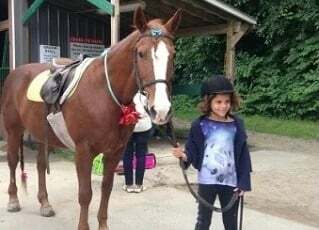 Each camp includes an off horse lesson portion and a riding portion, ending with a mini "show day" on the last day of camp where parents can come and watch what students have learned over the week. Students require a boot with a defined heel and jeans, leggings or breeches. This camp is for any student who has not had any formal lessons previously. Students are taught safety, grooming, working around the horse, leading, and how to tack up and untack. Riding lessons include learning how to mount, correct positioning and control of the horse in the walk and trot. This camp is for students who have completed one of our Introductory camps or has completed a series of previous lessons. Students should be able to tack up, have good control at the walk and have trotted on their own. Riders will continue to concentrate on the basics of good riding position, basic aids, and improved control at the trot. Riders may expect to repeat the Advanced Beginner level a couple times before they are ready to move on to the Novice level. This camp is for students who have previously enrolled in 3-4 week long camps or completed 3-4 months of consistent weekly formal lessons and are confident at the trot. Lessons will focus on increased control, starting to canter, and two point position as well as new stable management skills. Riders may expect to repeat the Novice level a couple times before they are ready to move on to the Advanced Novice level. This camp is for students who have been riding in regular weekly lessons for at least 1 year and are cantering confidently on their own. Teaching will focus on strengthening control, balance and positions of the riders, introduce pole work and small jumps as well as new stable management skills. 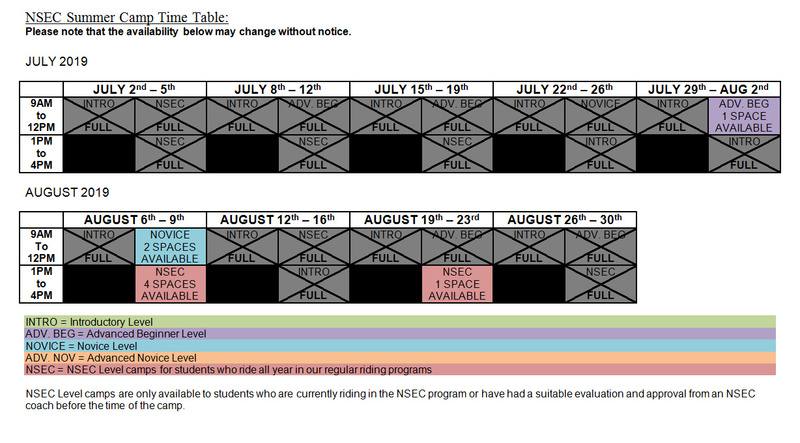 NSEC Leveled camps are for students who ride in regular weekly lessons at NSEC from September to June. The office will determine the correct camp and placement for each student and students will continue to work on and develop the skills they have been working on throughout the regular riding season. If you must cancel a summer camp that you have booked for any reason, we will make every attempt to fill your spot with another rider at no cost to you. If we are successful, you will receive a full refund. If we are unable to fill the spot by the first day of the camp, an account will be opened in your name with a credit for the camp balance that can be used towards fall lessons or a summer camp during the following summer.